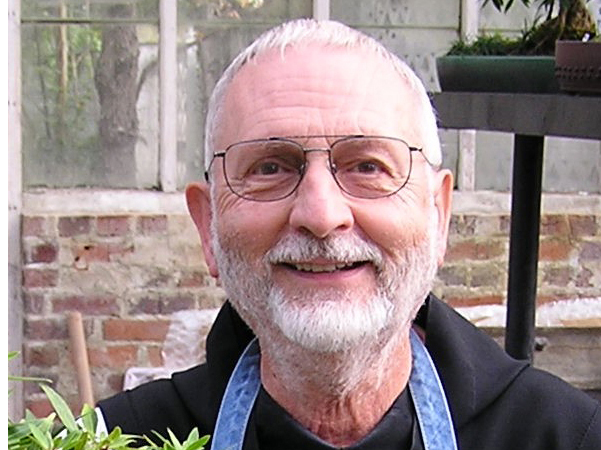 Brother Laurin Hartzog was born on July 29, 1930 in Bastrop, Louisiana. His parents were Preston Hartzog and Florine Alzier Hartzog. Brother Laurin graduated with a bachelor’s degree in education from Southeastern Louisiana College in 1952 and in English from the St. Michael’s College of Santa Fe in 1958. He received a master’s degree in economics from St. Mary’s University of San Antonio in 1965. Laurin did additional studies at Northwestern State University (Natchitoches, La.) and McNeese State University. Brother Laurin enjoyed crafts, especially creating wreathes for all occasions using flowers, leaves, fruits, pinecones and twigs. He entered New Clairvaux Abbey (Vina) in 1978, made solemn profession in 1983. He changed stability to Holy Spirit Abbey (Conyers) in 2003. Brother Laurin was 86 years old and had been in monastic life for 38 years when the Lord called him. Brother Laurin is preceded in death by his parents Preston and Florine Hartzog and his sister Shirley Powell. He is survived by his sister Phala Simmons of Alexandria, LA., also 5 nephews and 3 nieces. Eternal life grant unto him, O Lord, and let perpetual light shine upon him. In lieu of flowers, donations may be sent in Brother Laurin’s memory to the Monastery of the Holy Spirit, 2625 Highway 212 SW, Conyers, GA 30094.